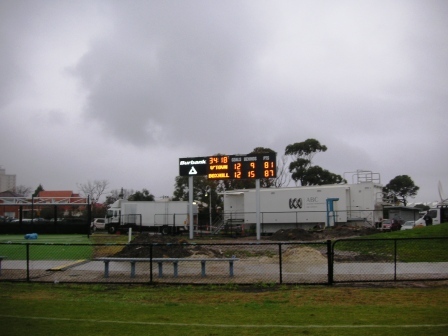 Williamstown unveiled its new scoreboard (and $8million ground and grandstand redevelopment) on a drizzly, grey day, in a losing game against Box Hill on Saturday 9 June. 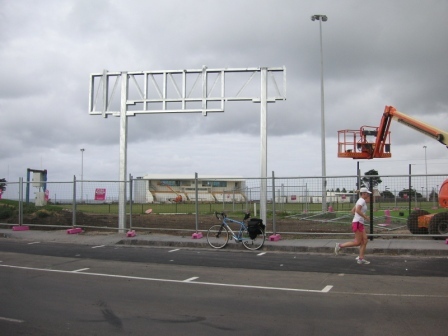 The scoreboard end was the scoring end and the Seagulls had turned their ten-point half-time deficit to an eight point lead half-way through the last quarter. 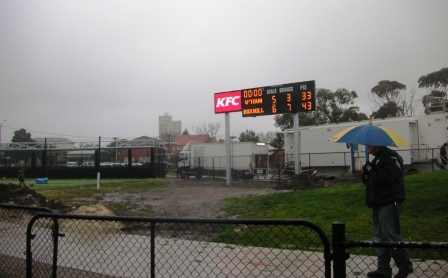 But Box Hill, kicking to the scoreboard end in the last quarter, wrested victory by a goal, holding on in the slippery conditions. The scoreboard is operated from the new-look W. L. Floyd Pavilion, from the right hand room in the middle of the top level (above the coaches’ boxes). 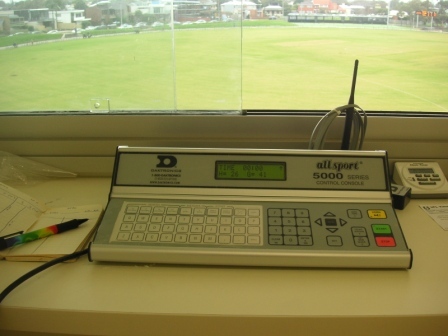 The scoreboard operator simply presses a few buttons and casts an eye across the ground to see the full score lit-up in bright orange. Lovely work Vin, was thinking of you on Saturday. A far cry from the bin on the Doug Hawkins wing! Was having a look around the ground on Friday with the boy and the scoreboard showed Willy leading North Ballarat! Done a lovely job of the ground. The old gun fort is certainly an interesting new-found feature! I follow the Borough but it’s fantastic to have this wonderful ground back. Grandstand does look a bit clean at the moment though! Love the new header picture by the way! G’day John. 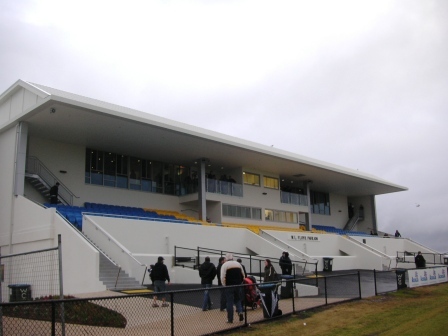 Glad to hear you’ve visited the new-look Williamstown ground. That Willi/North Ballarat score would have been from a Reserves (sorry, Development) game the previous weekend: a trial run not just for the scoreboard but everything else. 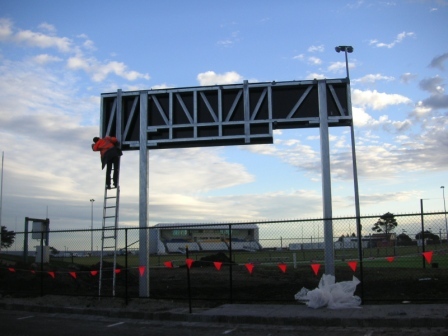 The grandstand wasn’t so clean after Sunday’s game against Box Hill – plenty of rubbish.